February 5, 2014—When crime rates drop, politicians like to give themselves pats on the back for being "tough on crime." But a new theory explaining why violence has declined across the country since the 1990s is gaining credence, and it has nothing to do with the criminal justice system. An article in Chemical & Engineering News details the mounting data that suggests taking lead out of gas and paint has played a critical role. Lauren K. Wolf, associate editor at C&EN, explains that violent crimes had reached an all-time high in the U.S. in the early '90s. But by the end of the decade, the homicide rate had plummeted by more than 40 percent. Multiple theories were batted around to explain the drop, from the mundane to the controversial. Was it due to an increase in police presence? Did the legalization of abortion lead to fewer unwanted babies who would grow into crime-prone adults? Recently, a new argument implicating lead exposure has gained prominence. 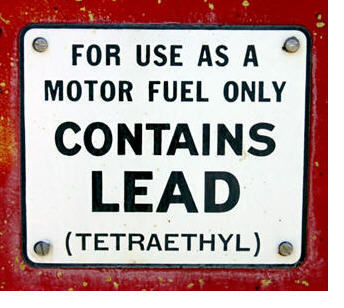 The article points out that lead, the once-ubiquitous heavy metal, spewed from car exhaust and coated building walls until it was banned from gasoline and paint in the early 1970s. Babies born post-ban were exposed to far less lead. Twenty years on, those babies became young adults who committed fewer crimes than their predecessors. Like an intricate puzzle, pieces of evidence from across disciplines—epidemiology, neurology, sociology, medicine and environmental science—are now interlocking and creating a fascinating portrait of how lead affects the mind, including lowering IQ, and causing attention problems and antisocial tendencies. "The Crimes of Lead," Lauren K. Wolf. Chemical & Engineering News, Volume 92, Issue 5, pp. 27-29 (February 3, 2014). Press materials provided by the American Chemical Society.